My name is Imogen Grace Newby. I was born June 2004 and live in the small market town of Halstead in Essex, England. I started shooting at 8 years of age, following the London 2012 Olympic Games. 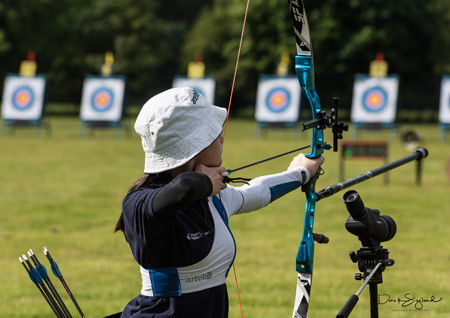 I have been an Archery GB Performance Academy Athlete for 2 years, heading for the 2024 Olympic Games. On my journey I have claimed county, regional and national titles, I have represented the county of Essex and hold 12 county and 3 national records and last year won the U14 National Indoor Champs for the 2nd year and was the Cub Champion at the AGB Youth Festival. Why Artebo and what does it do for you? I love Artebo Chestguards. I first saw the Artebo chestguard at my first Junior National Outdoor Championships back in 2013. One of my competitors wore one and I was intrigued what it was as I had basic plastic mesh chestguard. The material allows the archer to have a snug fit regardless of size and the Velcro fastening is so easy to get the chest guard on and off. But it is ALL about the fit. The chestguard has a short sleeve which comes into its own on a cold day when you wear additional layers. The sleeve covers baggy over garments and keep everything close to the body, allowing the archer to shoot without the worry of garments getting in the way of the string and aiding a clean release. It is lightweight and easily washable by hand and will dry overnight ready to wear the following day. I got into archery when my grandma and grandpa took me and my family to a classic car show in Brightlingsea. After being persuaded by my Dad to have a go at a Phoenix archery club stand and in his word’s, I came off with the biggest smile on my face he had ever seen and my archery career started. What are your long-term targets? My main long term target is to represent my country and win a gold medal in the 2024 Olympics. To do this means the world to me. I would also love to represent my country in other big competitions. Because of all the training I do I don’t get much free time. But when I do get some free time I love to read, listen to music, a little bit of photography, watch films and be with my family. I have been shooting since October 2012 but started in August just after the London Olympic Games. I train for approx. 20 hours a week I shoot at least 4 times a week on blank boss and target faces. I also do pre-hab, strength and core and physio work out 3 times a week.